Just imagine that you will be able to administrate the entire website with the Content Management Solution (CMS) without any HTML knowledges, or any aditional software (HTML editors, ftp file managers, etc). Simply log in to your administration panel , browse the website pages available, and edit the one that you need changed or add a new page. The good part is that you don't have to worry about the graphix (header, footer, menu butons) for every page. You will only handle the content of the site, our software does the rest. You will add text and images to your website with an envirement similar to Microsoft Word. You will be able to add new buttons to your website by using a simple form. 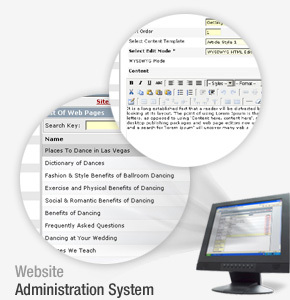 Training on how to administrate your website is included. Also, 3 months of free support. Allowing an unlimited number of templates in the system (in a site there might be one or more layout styles). Unlimited number of Content Zones / each template (i.e. Main menu zone, left column, main content zone, footer, etc). The number of content zones depends on the template. In one Content Zone you can place one or more Content Articles - we have named them content zones, but in fact they are sections of the page, that have a title, text, images, etc. It incorporates one of the best (We believe is the best) WYSWYG (What You See Is What You Get.) editor , that works easier than Macromedia Dreamweaver or Microsoft Front Page, allows uploading images from your computer to show on your website. You can define some content boxes (Those are some site objects that appear most often on the site) like footer links, for example. You assign that Content Box a name and when you want that content box to show you enter the name of the content box and it shows without having to rebuild it for every page. The big advantage to our Content Management System is that you edit once, and it changes on all website pages. No time consuming changing of all pages, just the content box. This does not have to be the footer. It can be the sponsors list, the contact details for each page, etc � things that you use often in a website, and instead of creating them each time, you simply enter the name of the content box. All pages of your website are optimized (Search Engine Friendly Links) to make the pages more search engine friendly and move your website move to page one on the search engines.